You better get it while the getting is good. Although the amiibo Retro 3-Pack was rumored to not be available for online pre-order, they appeared today on GameStop's website. If you're wanting to complete your amiibo collection you better act fast though. These exclusive figures are only available from GameStop in this 3-Pack deal. 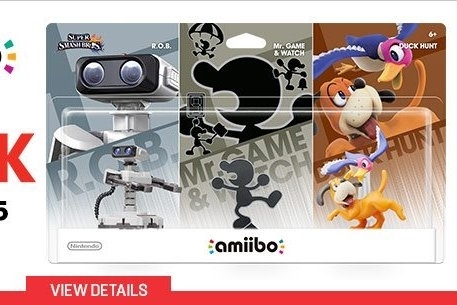 The amiibo Retro 3-Pack contains R.O.B., Duck Hunt, and Mr. Game and Watch, some of the most beloved of the obscure Nintendo characters. Luckily, those that didn't live near enough to a GameStop can have a chance to get these amiibo for a limited time. Don't wait too long to pull the trigger on these though. If the past is any indicator, these amiibo are gonna be gone in a flash.